We deeply appreciate that you have been working energetically to protect the global environment and animals. All the MFMAJ staff are always encouraged by you, Mary and Stella’s steady attitude and resolute remarks. In commemoration of your visit to Japan, we would love to hold a prize draw in connection with the MFM film, One Day a Week. Could you tell us about the background to ‘One Day a Week’ and your thoughts about making this film last year? The background to “One Day a Week” was that I hoped to make a beautiful film that explained the idea behind Meat Free Monday so that people would be encouraged to join us. Since interviewing you in 2015, MFMAJ has been doing various activities to promote MFM in Japan (holding events, leafleting, updating our website, providing vegan food to people in need through our VEGE AID project). As a result, awareness of MFM in Japan has increased remarkably, and many people, including your fans, are becoming involved in the MFM campaign. Would you give us your impression of this situation and a message to the Japanese people who are joining the MFM campaign or considering joining? I am very happy that the activities of MFMAJ are helping people to understand the importance and the fun of MFM. I thank the Japanese people and hope they will keep on supporting us. Thanks Paul! 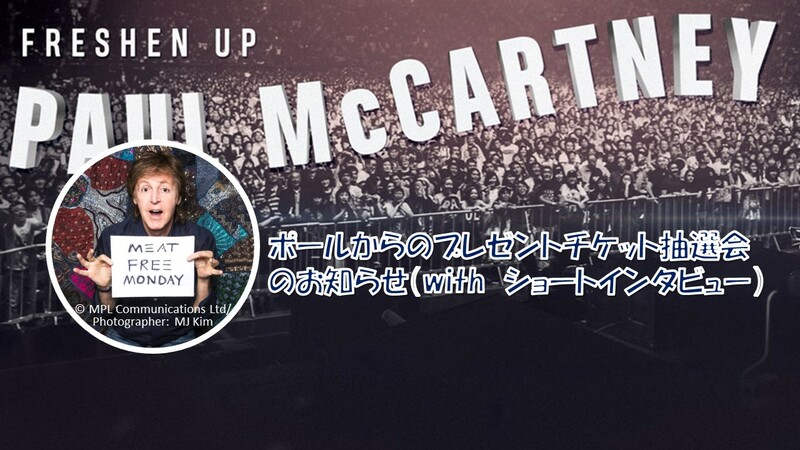 We’re looking forward to seeing you again at the concerts in Tokyo and Nagoya!